VT and GT suffered a little scare. The other top seeds, Clemson and UNC took care of business easily. While the wind wasn’t blowing, the Wolfpack tried using zone against Virginia Tech to erase a 7-3 deficit. 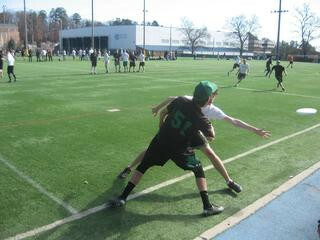 Burn’s offense looked shakier than the day before, throwing passes away and being nonchalant with upside down throws. There were numerous times where the NCSU zone left wide open spaces for Scott Forrester’s reach. 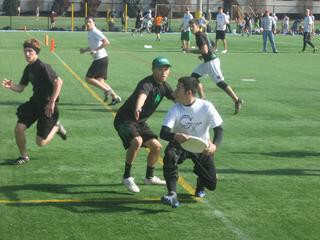 However, the spaces were so wide open that often two Burn players were going for the disc. Several drops and mis-communications would lead to several Wolfpack breaks. VT would gain a little momentum, and go into half still up 8-6. Burn quickly built a 10-7 lead early in the second half. #42 Troy Ukrop almost gave me a new banner, throwing a no look scoober against the zone. However, my camera wasn’t at the ready, and I’ll have to wait for another one.Unfortunately the offense didn’t stay consistent, letting NCSU right back in at 10-9. Evan Kline looked eager to play, but decided to rest his ankle even though his team was “Giving him a heart attack”. Burn finally seized control going back up to 12-10. Alex Brown made a great read on an NCState in cut and came off another defender to give VT another break. 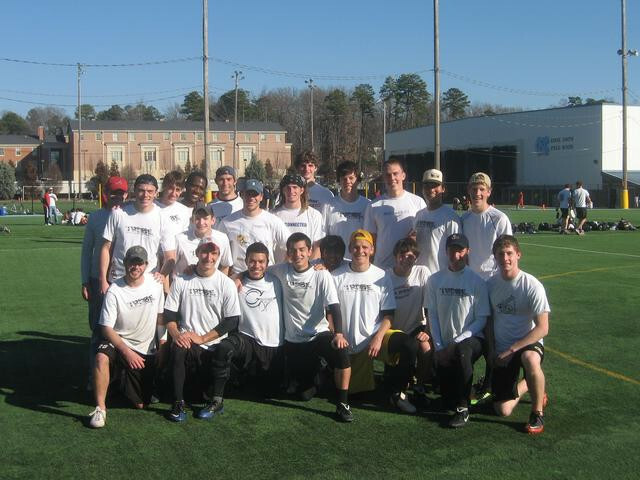 Tech survived the quarters scare 15-12 to make it to the semi-finals. Clemson loves getting up early, and making it close at the end. After being tied at 2, Clemson implemented a 2-3-2 zone that stifled Duke’s offense. They would go up 6-3, and when I would check in, they were up 9-3. 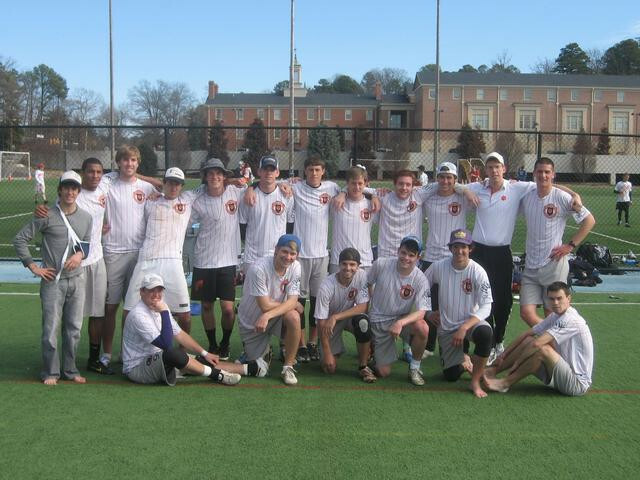 Duke made it respectable at the end, but the Joint Chiefs would come away with victory 15-11. This was on the other field, 10 minutes away. UNC took care of business 15-10 to advance. Evan Ponchick told me UMD had heart, and again it showed. Down 7-3, the “Bastards” didn’t quit, bringing the score to 11-9. The Tribe looked like they were on the verge of collapse when Maryland #5 Freddie would get the kick block and finish the bookends to bring the count within 1. The teams would trade the next point, but GT would pull away with the end. I was eager to watch Virginia Tech and Georgia Tech battle out in the semis. As James Cox reminded me, I said I would be shocked if Burn wasn’t in the finals… After their earlier offensive performances, I shouldn’t have been too shocked. The Tribe would start the game out on offense, putting up a 4-1 lead with relative ease. Nick Lance would be busy early, finding EJ with a hammer for the first point. 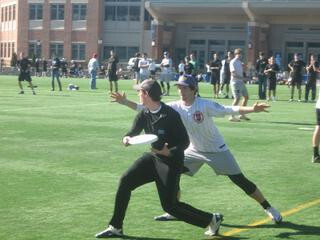 After a VT score, #11 would find the other consistent handler #00 Victor Lesniewski. At 3-1, Lance would get a D on the 6’4” Scott Forrester, and GT would be up another break. At this point, Burn called a wise timeout to slow Tribe’s momentum. The teams would trade for two points with a nice over the shoulder catch by VT’s #74 John Andrukonis and Scott Forrester going over Hogan McHugh to make it 5-3. This game was virtually over as the Tribe would break three times to take half 8-3. They would break two more times to start the half, building insurmountable lead at 10-3. VT would get some points here and there, but looked mentally checked out. It seemed that having to close out games on Saturday took its toll, and that the offense needed to shake the rust off. The Tribe would advance to the finals on a 15-7 victory. Clemson would stay within striking distance early, but did not make enough offensiveplayers to keep with Darkside. UNC would be up 5-3, and then run away to a 9-4 lead. The play making abilities of #1 Tristan Green, #6 Christian Johnson, #10 Roswell Sayre-Mccord, and #8 would be too tough for Clemson’s D. Paul Corbett would fill in with solid handling delivering to the athletic UNC cutters. 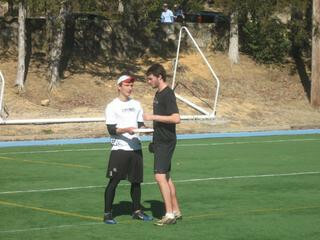 Afterwards the teams would trade out to a Darkside 15-9 victory. I was looking forward to the final, as it was a rematch of the Game of the Day on Saturday. I agreed with Clemson’s James Cox that Georgia Tech looked ready to exact revenge and take the title. Really, I was just going with the notion that it’s incredibly difficult to beat the same team twice. I expected the Tribe, led by Nick Lance’s club experience, to prevail in the end. Early on, I felt confident with my prediction as GT jumped out to a 2-0 lead. However, UNC would score and break to tie the game at 2’s. Both teams would trade until 6-6, with Darkside gaining a little edge from the home crowd. 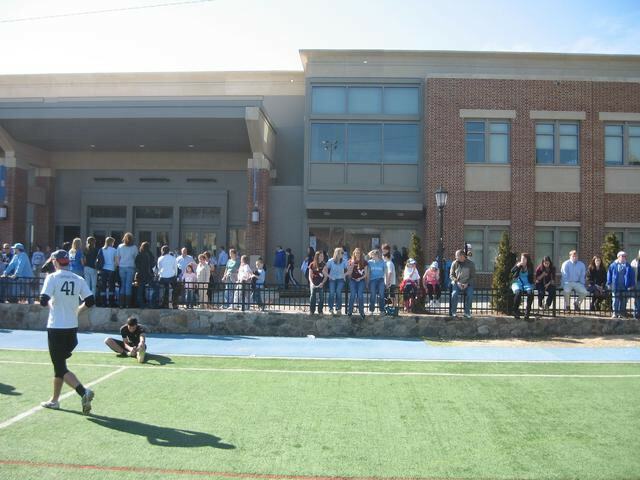 Spectators had lined up in front of the Women’s Basketball Arena and gave the apperance that this was a home game with all of the Carolina Blue around. Nick Lance would have a hammer tipped by Sayre-Mccord, allowing UNC to up 8-6 and take half. Darkside would start the half on offense, but the Tribe refused to go down three. After a deep throw away, #1 Taylor Rasco would layout for a much needed break. After a few points, Tech would get another break bringing the score to 9 all. After 4 consecutive drops, 2 for each team, Tech would come out on top 10-9. While UNC would tie the game at 10’s, the Tribe opened their biggest lead of the game at 13-10. Darkside certainly wasn’t lacking the talent to come back at this point, but GT felt confident that they could rest on Nick Lance and Hogan Mchugh to get the remaining 2 points before UNC got 5. Darkside would get one more, but the Tribe would seal the seal with a break, winning 15-11 and taking the ACC crown. Video of the final point below. Look later for a more detailed recap on both UNC and Georgia Tech match-ups! Technically I attend Georgia Tech through distance learning masters courses, so I guess you could say I was pulling for them a little. However, UNC took a huge step forward in my book, showing talent across the board. They were extremely impressive all weekend with their intensity. They were tight on the marks, even if sometimes they were a little too tight, and they were cutting from everywhere. When you have 3+ guys that can put it deep, it makes the offense very versatile. They were also playing without their supposed #1 guy, Noah Saul. Georgia Tech also has a bunch of throwers and cutters that complement Nick Lance’s play making ability. Hogan McHugh should be a beast if he continues to work hard, because his size is incredibly valuable on the Ultimate field. Virginia Tech took a little bit of a step back, but I would not be too worried about them. In the fall they showed they had potential to hang with the nationals contenders, and I think this tournament just showed that they can’t waltz into a tough tournament and walk through competition. Once the offensive mistakes get corrected and Evan Kline comes back, expect Burn to be right up their with UNC, UVA and UNCW. The Clemson guys are a great bunch, a lot of fun to hang around with. I would love to see more intensity out of them. Ben Slade has them playing smart, and they know how to exploit the other team’s weaknesses. They are still a tier below the top 3 teams at this tournament, but could challenge them with some hard work. The way that #3 Joseph Bell cuts is the way that Clemson should be cutting at all times.